Blueberry? How about Cranberry Tea? Having experimented with some left over cranberry sauce, I thought I'd try out some blueberry jam and see how blue it left the lace. The thread ends are more blue than the lace is. The lace is almost the same colour as the cranberry sample. How weird is that? Of course all of the additives made to the jam might be responsible for the reddish purple colour. Or maybe blueberry really is red!!!??? Notice the rings attached to the central ring? See that one of them is larger than the others? When I'm designing something new I start with a stitch count I think will work. If it doesn't I have the choice of starting again, or correcting the stitch count and continuing. If it's a scrap bit like this, I just keep going because I know it's going to have to be done over again anyway. Sometimes, you just need to do a test piece. I made a double batch of cranberry sauce this year. Half of it was meant to go with the turkey and the other half formed the base for orange cranberry raisin filling for some Christmas cookies. I made the sauce with orange juice instead of water and that may have affected both the overall colour and the staying power of the cranberry colour. I had a lot of cranberry sauce and filling left over so I did some more experimenting. I like it better than tea colour, but I mashed it hard enough to cut the thread. Either I sew it down fixing the break by tacking it in place or I cut out the break and re-do the chain after first matching the cranberry tea colour. Who am I kidding? I'm totally going to sew this mistake down. A. Ladies cotton T's cost more than twice the price of men's. B. I in variably splash tomato sauce on them. C. The parrot's claws go right through the fabric poking lots of little holes through the shoulders. That being the case I either walk around in tattered and stained clothes or I replace my shirts more often than the average woman. Which brings me back to A. So I have been buying a lot of men's T's and adding tatting to them. Since I splash a lot of whatever I'm cooking onto my shirts anyway, I was wondering what it would look like if I used natural dyes on fabric and or tatting. For how very red the fruit is, the lace looks kind of purple. 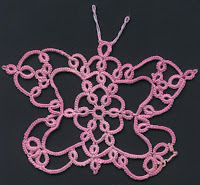 I mashed a couple of berries into this little bit of white tatting then rinsed the residue off and washed the lace in a bit of dish soap. The colour isn't even and while I like how it looks on lace, I'm not sure what it would look like on a shirt. Of course if I ran the cranberry sauce, minus the sugar, through a blender, strained it and then left the shirt soaking in it for a good while I might get a darker and more even colour. Judging by the way the cranberry stains aren't coming out of my clothes even with repeated washings, I can be reasonable sure that this colour won't ever run. The lace is just a little doodle of something or other I was designing so it was a scrap bit. Now that it's such a pretty colour I'll have to do something with it. I suppose it's typical of the season that people are busy doing lots of seasonal activities and consequently we don't have a lot of time for blogging. I've managed to keep the 25 motif challenge blog reasonably up to date and at long last the November newsletter has been sent out. That's right, here it is in the middle of December and I've only just sent out the newsletter. I usually put lots of Christmas-y patterns in the November newsletter, but I realize that a lot of people like the Christmas theme designs earlier so that they can actually tat them as Christmas gifts. Consequently some of the designs were in the August issue. 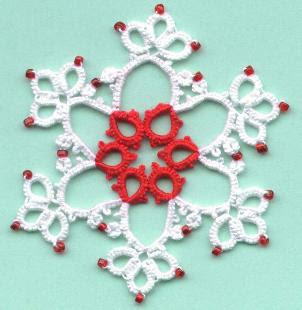 Here's a picture of the snowflake I sent out this year with my Christmas cards. Does it remind you of anything? It should, it's another variation of the same snowflake. More stitches on the inner rings and the chains, extra little rings in between the chains and some beads added in, but still the same general idea. 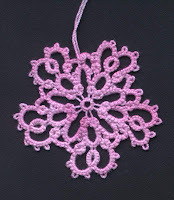 Since my last posting I've done over a dozen of these flakes as well as re-tatting the pink doily and various other small snowflakes and earrings. 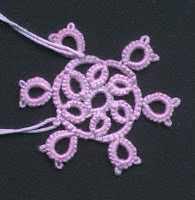 The pattern for these are in the newsletter and those of you who subscribe to it will find it in your in-box. Now, I'm going to take my aching thumbs and give them a rest, right after I update the challenge page.